In college days, I always drink this cold coffee. From that time I am a huge fan of this cold coffee. It's very simple to make and it tastes so nice. That time, a long queue always made in the front of that cold coffee shop. So, we have to wait for the coffee but when we get this coffee in our hand we feel we are in the heaven. but I suggest you must use only milk, not water to making this cold coffee. Because when we are blending it with ice cubes it's consistency becomes somewhat thin which we don't want that's why we are taking all milk for the first time then we are using ice cubes. 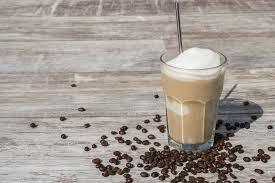 Ice-Cream in the cold coffee gives a rich texture to the cold coffee with a nice taste. 1. Boil the milk firstly. 2. Then take 1/4 th of milk into the pan and take out remaining milk outside. 3. In the pan put the coffee powder, and let it boil for 5 minutes. 4. Then switch off the flame and let cool down the coffee. 5. Now take a liquid mixture jar and pour this coffee into that. 6. Then put remaining milk, sugar, and 3 scoops of ice-cream and ice cubes in the jar. 7. Turn on the mixture. 8. Blend it for 5 to 6 seconds. 9. Then put this mixture into the serving glass. 10. Garnish it with remaining vanilla Ice-cream on the top and serve it cold.